Nutfield Genealogy: Memento Mori – If you have ancestors from Ipswich, Massachusetts READ THIS! Memento Mori – If you have ancestors from Ipswich, Massachusetts READ THIS! Memento Mori is a phrase I see scattered across Puritan era tombstones all over New England, and it is also the name of a guidebook on the Old North Burying Ground in Ipswich, published in 1935. This graveyard was established in 1634, and the book contains transcriptions of the epitaphs. 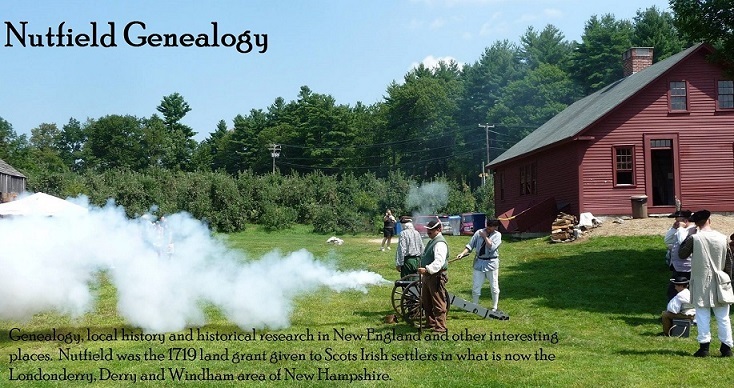 It is an invaluable resource for exploring the Old North Burying Ground. When you see how the stones have weathered since 1935, you’ll be grateful to have these transcriptions. A few years ago I explored this graveyard and searched for several ancestral tombstones. I was successful mostly because of this book and some other finding aids I had found online. You can read all about that trip to Ipswich and the Old North Burying Ground by clicking HERE. I had attempted to download all the needed books, maps, guides and such to my iPad for exploring and photographing. It helped, but it was quite a process to put it all together. Previously, most of what I needed was found at this link http://www.historicipswich.org/ipswich-cemeteries/ , and also from other sources. 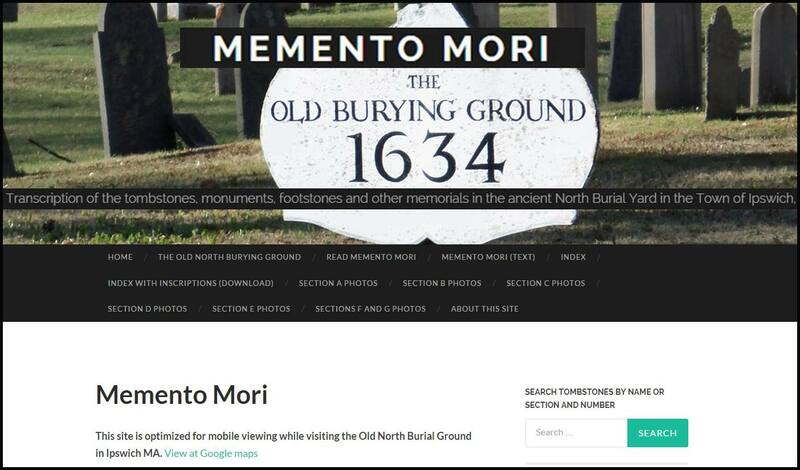 Now, if you are headed out to explore Old North Burying Ground, or if you are exploring from home via the internet, there’s a website for you! Gordon Harris, the town historian of Ipswich, has put together a website titled Memento Mori Ipswich http://mementomoriipswich.org/ Everything you need for exploring the cemetery is on this webpage. The book Memento Mori is available to read online at this website, for both computers and mobile devices. There is a scanned version, and a transcription. An index is also available, sorted by surnames giving the map location. The index with inscriptions is downloadable only, and not available online to read unless you open up the PDF file. For me, I just added it to Evernote to have it handy. Best of all, there is a search button where you can enter a name or surname and the relevant pages pop up. Perfect! When I’m at the Old North Burying Ground the most difficult part of searching for a tombstone is using the maps. There is a map of the entire cemetery showing sections A through H. Then you have to choose map A, or map B, or map C, etc. I found that it was easier to print out the maps as large as possible since they are very difficult to navigate. I take time at home to mark out the graves I am searching on these maps in red ink or yellow highlighter. It's much easier than trying to do this on site at the cemetery. Take this advice seriously. The part I like the best is the photos. When I was searching for tombstones I didn’t know if I was looking for a big stone, little stone, obelisk or what have you. Now, you can easily look at a photo of the tombstone and pick out the one in the rows before you. It’s easy if you know you are looking for a rectangle, or an arched top gravestone, or even if you are looking for a broken or damaged stone from the photographs. Some of them have yardsticks on the ground in the photo to give an idea of the size. Great idea! The website is easy to navigate and should make your cemetery exploring much easier at the Old North Burying Ground. Thanks, Gordon! Great resource thank you for posting this.